We had our last meeting of the year, and the club will continue as usual next year with our next meeting scheduled for Sunday 10 January. At the club today, Robbie and Lyndon played a Flames of War game. Lyndon was using Rob's army from the recent tourney. There was a 15mm FoG ancients game between Philip (using New Kingdom Egyptians) and two new club members Sam and Michael, using Alexandrian Macedonians. Brett and Kendall played FoG Napoleonics, with the Austrians getting a comprehensive win over the Prussians. We had three games at the club today. One was a Warhammer game, and the other two were Napoleonics. John and Roland had a game using the new La Salle Napoleonics rules, and Brett and Philip had another playtest of FoG-N, with the Austrians easily defeating the Dutch-Belgians. 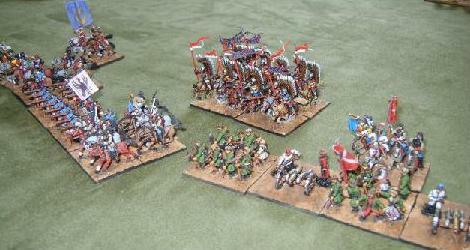 Several of our Ancients players went over to the Auckland Wargames Club today for the DBMM 25mm tournament. There were three rounds, using 240AP armies. We used the latest draft of the DBMM 1.1 rules. Robbie got the best placing of all the NSWC players there. Lyndon and Kit had a Flames of War game using Russians and Germans. With the DBMM240 competition coming up next weekend, there were several more practice games. 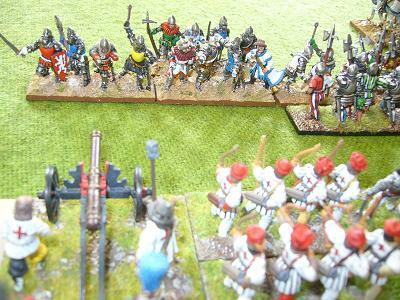 Pictured above: Dismounted English knights from the Free company are about to overrun the artillery and archers of the Tudor English army. Brett and Lyndon played a game of Flames of War, Finns v Russians. Andrew (Italians) beat Philip (Dutch-Belgians) in FoG-Napoleonics. Robbie and Dan played Warhammer, using Beastmen and Skaven with the new book. The Auckland club is hosting 'BennyCon' (DBMM200 in 25mm) at the beginning of December, so we got in some practice games using the draft 1.1 rules. Benny (Carthaginians), Brett (Persians), Kendall (Hussites), and Philip (Tudor English) had three games - Hussites v English, Hussites v Carthaginians, Persians v English. It was a good trial of the 1.1 rules which worked pretty well with the smaller games. Just the one game at the club today, as most of the club regulars were at the Battlefront tourney. 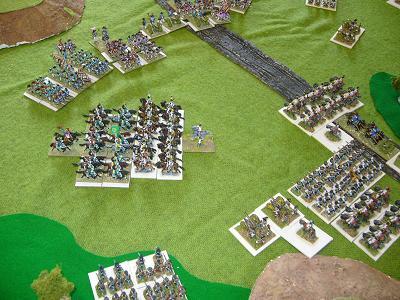 Kendall and Philip played Napoleonics using the 3.1 beta version of the Field of Glory rules. It was a very hard fought game between the Prussians and French, resulting in a draw but with lots of action for both armies. 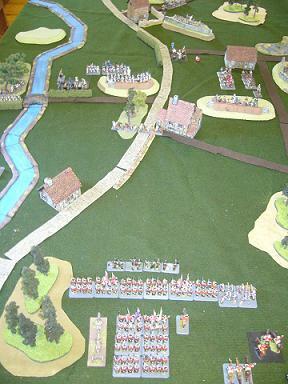 The Prussians attacked one flank of the French army but couldn't take the two villages that the French were defending. On the other flank, the main part of the French army advanced rapidly, and then retreated rapidly when the Prussian cavalry counter attacked. The Battlefront Late War GT was held at the Mt Eden War Memorial Hall on Dominion Road. It was an excellent tournament, 54 gamers, including two who flew over from the US to play (one of whom, embarrassingly, will be flying home as NZ champion!) Brett won the Best Army trophy and prize for his Finnish Sturmkomppania. Robbie came 2nd overall (British Guards Armoured Squadron), a great result, Kit, Lee and Ken were somewhere in the pack. Brett and Philip had a game using the latest draft of the FoG-Napoleonic rules. Brett's Austrians defeated Philip's French Army of the Orient. This weekend we held the DBR Push of Pike tournament. There were 8 players, and the winner was Richard Foster using Ottoman Turks. Rob and Dan had a WHFB game, with Rob's African Ogres beating Dan's ratty Skaven. A good practice game for the victorious Ogres with Fields of Blood coming up in a couple of weeks. Kendall (Imperialists) beat Philip (Persians) 9-1 in DBR 15mm. Another good practice game for Push of Pike. Not a good run for the Persians with only 1 win out of 5 practice games so far! In FoG-Napoleonics, Andrew got a convincing win with his Italian/French army against Brett's Austrians. The new command and control rules were tested, and the game came to a more decisive conclusion. Grant, John, and Keith had an AWI game. It all looked spectacular in 28mm, pictured here. Just the two games today. Firstly, Benny and Nick had a Flames of War free for all, between the Italians (with allied German Panzer IVs) and British western desert armies. Both had all armoured forces, without any infantry at all. In the other game, Brett and Kendall played FoG-Napoleonics. It was a moderate victory for Brett's Austrians against Kendall's Prussians (based on the II Corps from the battle of Bautzen 1813). Two Flames of War games - Ken's Germans played against Rob's British armour in the morning, and then in the afternoon played against Kit's Russian guards. The second game was an epic struggle, ending with a polikarpov making repeated attempts and finally destroying a German battery to break their army, just as Biermeyer drove over a Russian objective. There was another PoP training game, Grant's Poles getting a decisive 10-0 win over Philip's Persians. The misty weather continued throughout the entire game, causing some PIP problems. We had two games at the club today. 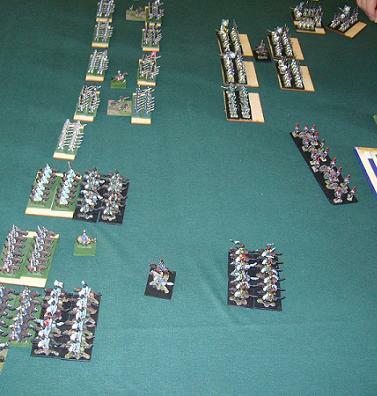 One was a FoG-Napoleonics game between Brett (French) and Kit (British). The British were ahead on points, with their Guards seeing off an Old Guard attack. In a DBR game, practicing for Push of Pike, Philip's Persians won 9-1 against Benny's Venetian Colonial. WHFB - Dan (Skaven) played Rob (Demons), pictured here. DBR 25mm - A 500 AP early period game between John (Spanish Imperial with English allies, pre 1534) and Philip (Tudor English with Maximilian allies, 1513). A 9-1 win to the Empire. Both allied contingents did just enough on their flanks to justify their employment, but not enough to endanger themselves. Meanwhile the Imperialist pike block destroyed the English billmen in the centre of the battlefield for almost no loss. FoG-Napoleonics. Andrew (French) played Brett (Austrians). A long game on a table heavy with terrain, but the Austrians got the win. Kendall and Kit played a Rapid Fire game, Brits and Australians vs Germans and Italians. 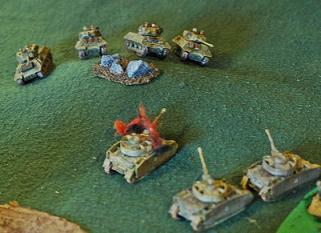 The scenario was based around the Allies defence of Tripoli, in which the Axis was repulsed in this game.